Hello my lovelies..sorry I've been neglectful of my blog once again! Work has been pretty hectic of late, but ta-dah, I'm finally here to write up some lovely little blog posts! How've you been? Last Sunday, I was invited to a little blog event organised by two fellow northeast bloggers, the lovely Danni and Kloe. It was at Walkabout in Middlesbrough and we were told to do one main thing, bring cake. For anyone who's not on the northeast scene, I'm yet to meet a blogger from our neck of the woods who doesn't like cake...in fact I'd go as far to say that many a friendship has been formed over a slice of icing-sugary goodness. We'd even go to the opening of an envelope if it involved cake, so needless to say, I was in. For my cakey contribution, I made chocolate marble cake...but foolishly forgot to take a picture of it (doh! ), and then set off with my cake tin to meet Lisa on the train. 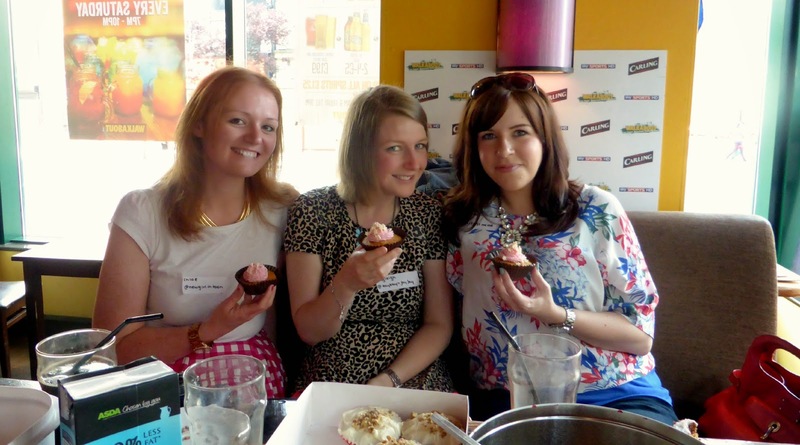 We arrived a little late to the event, but when we got there, we spotted loads of lovely northeast bloggers...and sooo much cake! We sat with Chloe who introduced me to Caroline, and I also chatted to Steph, who made the most amazing cornflake cake! I also met the lovely Cate (whose After Eight biscuits were to die for) Nicola and Kelly. I couldn't remember which cake belonged to which person, but everything I had was absolutely amazing, I'm just sad that I didn't have room left to try everything! (also, to anyone reading this that I've forgotten to mention, I loved speaking to you all honestly...I'm just rubbish with names!!!) Special mention also goes to my new twitter friend Lou Duffy, who couldn't make the event but sent her superhero boyfriend to the party with the best carrot and walnut (I think!) cakes I have ever tasted...party in my mouth! I'm so glad my Mister doesn't make cakes that good...I swear I'd be the size of a house within a month! The company was great, the raffle prizes were cute, and the goodie bags were unbelievable! I was so excited to receive some Lush stuff, and the cutest little piece of jewellery ever (which I'll save for an OOTD post later...watch this space!). So thanks to Danni and Kloe for organising such wonderful treats for us! Heaps of praise go to Danni and Kloe for making the day such a success! My Mister also wants to say a special thanks to all the cake-baking bloggers that made his packed-lunch so interesting this week! Such a good day had by all. Also wanted to say I'm sorry if some of the photos were unflattering to any of you ladies, I was snapping away as best I could so apologies if I caught any of you in a bad light...you're all beautiful anyways! As usual, I was hopeless at getting a photo of me and my best blogging buddies, but Chloe managed to get a great one and has kindly let me borrow it (thanks lovely! ), next time I must snap more and eat less!!! A great event and amazing cake, thanks to all! Lovely post. :) Was great to meet you, look forward to the next!